That's great news for the Hawkeyes, and bad news for the suddenly scuffling Buckeyes. A tough, gutty second-half performance lifted the 25th-ranked University of Iowa men's basketball team to a 72-62 victory over No. 16/17 Ohio State on Saturday afternoon on Mediacom Court inside Carver-Hawkeye Arena. 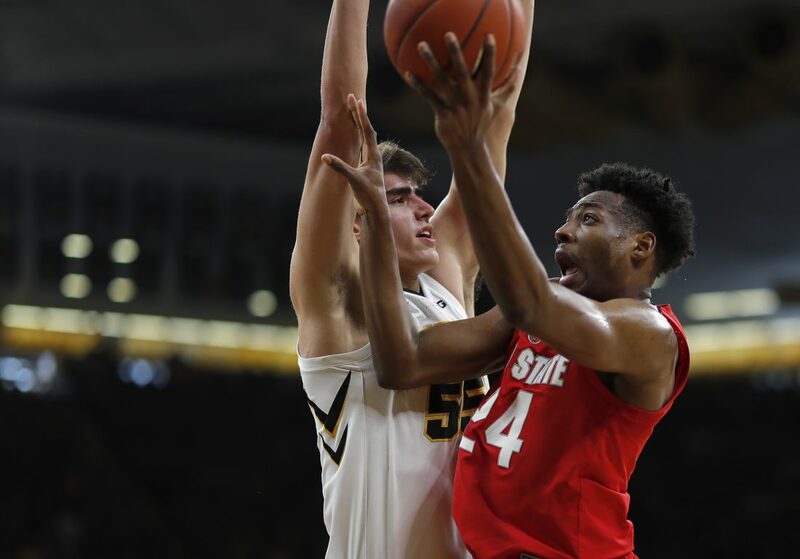 This was defense on a day defense was absolutely necessary for Iowa, which won its third game in seven days to improve to 3-3 in the Big Ten and 14-3 overall. "With anything, you put a lot of work in your going to get some benefits." junior guard Jordan Bohannon said. Wesson was held to a season-low two points on 1 of 5 shooting. "I wasn't expecting he'd get 2, but I didn't want him to get 20". "That was part of our game plan, to play physical with him, go through him, go through him, try and get him to foul", Iowa forward Ryan Kriener said. It was Cook's first action since January 6, as the forward missed Iowa's 73-63 win over Northwestern with an injury. Tyler Cook? "He's a little sore", said Hawkeyes Coach Fran McCaffery. Iowa contained Ohio State forward Kaleb Wessen to just 2 points in almost 24 minutes, and he finished with 4 fouls (for reference, the big man entered Saturday scoring 17.1 points per game). Minnesota 88, Rutgers 70: Amir Coffey scored 29 points to lead the Golden Gophers' balanced scoring attack in Minneapolis. He also pulled down seven rebounds. Luther Muhammad tallied 13 points plus six rebounds, two assists and two boards. Joe Weiskamp paced the Hawkeyes with 19 points on 7-of-11 shooting including 2-of-5 from 3-point range and 3-of-5 at the free throw line. Tyree Appleby led the Vikings (5-14, 0-6) with 23 points. Luka Garza tallied 16 points and five boards off the bench. Isaiah Moss added 12 points, four caroms and four dimes. In the second half, he shot a flawless 5-for-5 from the floor. Valparaiso ran the shot clock down before Lavender broke free for the clinching points. After trailing 26-24 at the half, Iowa dominated the second half, outscoring the Buckeyes, 48-36. Akron (9-7, 1-2) led 34-25 at halftime. Their team figured things out in the second half. North Dakota 71, Western Illinois 65: The Leathernecks lost control in the second half in a Summit League loss in Grand Forks, N.D. The Hawkeyes, on the other hand, could return to the poll after a 2-0 week. California Baptist 77, Chicago State 75: Ty Rowell's wide-open 3-pointer in the final seconds gave Cal Baptist its first road win as a Division I program. Rowell dropped his fourth 3-pointer for the lead with 11.1 seconds remaining.